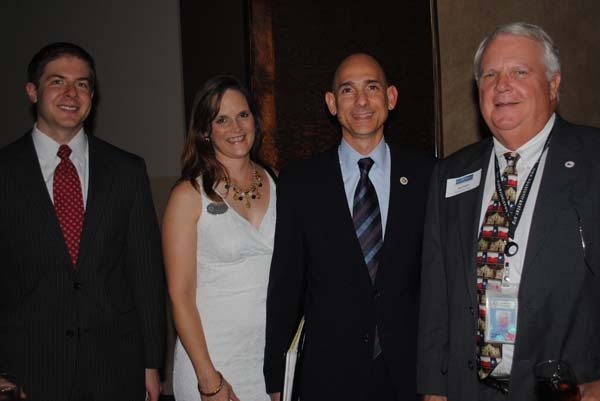 State Rep. Dr. Greg Bonnin, center, and his wife, Kim, stop to talk with Harris County Director of Transit Services Ken Fickes, right, and Boeing Government Operations Manager Brian Freedman as they join the crowd at the Bay Area Houston Transportation Partnership reception at Cullen’s Upscale Grille. State Rep. Greg Bonnen is both pleased and disappointed with his first term in the Texas Legislature. Pleased that the state lawmakers came up with a plan to make sure Texas is able to meet all its water needs in 2050 but disappointed they did not solve the state’s insurance problems. Speaking at Bay Area Houston Transportation Partnership reception held at Cullen’s, he told how he often had some 200 pages of legislation to review each evening – which reminded him of all the work he had in med school – and how his younger brother, who represents nearby Brazoria County in the Legislature helped him understand how things work in the state capital. Many problems and not enough money. But, at least the lawmakers approved two proposed amendments to the Texas Constitution that would allow for the use of unneeded funds in the state’s Rainy Day Fund to help solve water and transportation problems. One amendment appropriating $2 billion from the Rainy Day Fund to provide for a water infrastructure plan will be on the ballot Nov. 5. The neurosurgeon, who served on both the House Appropriations Committee and the House Insurance Committee, said he is hopeful voters will realize how important the water management plan is and approve the amendment. He was introduced by BayTran President Barbara Koslov, who invited the audience to the next BayTran luncheon at Cullen’s Upscale Grille at 11:30 a.m. Wednesday, Sept. 19.